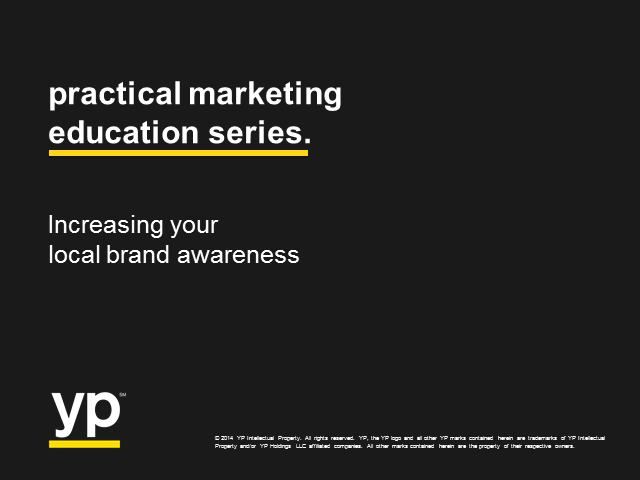 Join us for another session of our Practical Marketing series to learn about increasing your local brand awareness. Every small business needs to define who they are, to tell their unique story, and to attract attention and awareness from the right target audiences. Our small business experts will share thoughts on immediate action items to help you do just that. Discover how to leverage cloud, mobile, and social technologies that will allow you to stand out from your competition. Watch and learn from small business experts, Gene Marks and Ramon Ray, as they discuss the latest trends, tips, and services to help you grow, manage, and increase your profits. Presented in conjunction with SBA’s National Small Business Week events. Consumers are serious researchers. When hunting for a new product or service, they will search across devices, use multiple sites and make decisions after viewing engaging articles, videos, and images. Small business owners have the challenge of being where consumers are looking and providing the right information. Engage the experts in creating an impactful digital footprint. Join Steve Strauss, USA Today Small Business columnist, and Jeff Biesman from YP℠ for this action-oriented conversation. Marketing for mobile devices is very different than other forms of digital marketing. Now more than ever before, the When and Where are the foundations of attracting customers - whether it's just to get that lead or to make that sale. Ramon Ray, founder of Smart Hustle Magazine walks us through the world of mobile to identify its differences & connections to larger screens. Email has the highest ROI of any tactic, and despite claims that the medium was dying its impact has not decreased. However, it’s still a challenging tactic with which to get results. This class will cover how to send more effective messages, how to identify segments that will boost engagement, how to test the elements of your messages to get the best results, and how to look beyond the open rate of an email as a measure of success. Discover how to effectively leverage the 4 major social media platforms—Facebook, LinkedIn, YouTube, and Twitter—to achieve your marketing goals. You'll quickly learn how to drive more fans, followers, and conversions, and start improving your social media marketing today. Everyone is on-the-go these days, and along for the ride is everyone’s respective mobile device. Accessible wherever, whenever, mobile is quickly becoming our primary source for information, research and, ultimately, for making purchases. So how best do we leverage the power of mobile in our marketing strategies? What tactics work? And more importantly, how do we know what works best for us and our businesses? Mobile marketing offers lots of opportunities and this webinar will explore today’s tools and best practices to implement in your own campaigns today. Lead Generation & SEM. Sometimes, digital marketing may seem a bit daunting. We know what we want to bring in – business – and we know that online inbound marketing is the way to do it…but we may not sure of exactly how to go about it. Highly competitive, yet highly profitable – if done right – this webinar helps simplify SEM and its best practices, introducing you to keyword selection, landing page optimization, tracking, testing, and maximizing your return. Great content engages your audience, helps with lead generation, lets you learn where leads are in the buying process, and helps sell. Creating content that includes all of these components happens because it’s designed to pass leads along a guided pathway from basic curiosity toward a desire to buy. It includes clear directions toward action, with compelling content that encourage conversion. It can be used and reused across websites, blogs, emails and more. When it all comes together, how a visitor consumes your content tells you where each lead is on the path towards becoming a customer. In today's digital world, traditional branding is not enough. You need a story to extend your brand. And, you need to understand the right people to share it with. Learn how world-class brands are using traditional storytelling techniques to achieve big results and how you, too, can share your story with across multiple platforms to the people that matter most, your customers. Judi Knight CEO of New Tricks shares insight into Small Business Websites. Today’s consumer is always connected, but are you? Hear from Greg Sterling, senior analyst Opus Research, on the mobile landscape and small business strategies to interact with customers on-the-go. Hear from DIYMarketers’ Ivana Taylor on how marketing can make a difference for your small business. Registrants will get access to the white paper series "The Case for Small Business Marketing"
Gain insight about how to get the most from your marketing time with a 5-step practical marketing plan focused on “doing” ¬– not marketing theory. For more information about National Small Business Week, including a complete list of events and locations, please visit: www.sba.gov/smallbusinessweek. Content Marketing Institute's Joe Pulizzi shares practical marketing "do it now" tips on how small businesses can make the most of their marketing efforts through the use of content tactics and tools. The No-Nonsense Practical Marketing Online Education Series produced a great many small business marketing questions from the thousands who participated. This webinar will address some of those questions and official launch YP's Practical Answers initiative. •Who’s Talking about You & What to Do about It? Practical marketing advice to help small businesses thrive and grow. Small Businesses - their owners and marketers - wear a lot of hats: customer service, operations, finance. Marketing is an important hat that needs to fit right. We at YP help small businesses with practical marketing advice that builds brand, boosts bottom lines, and maximizes efforts.